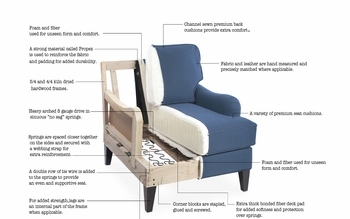 Custom Furniture proudly crafts high quality upholstered furniture that fits today’s active family lifestyles. Our designs are up to date and easy to live with – no stuffy sofas here, and no fussy, hard-to-care-for fabrics either. Our built-in quality is every bit the equal to – and sometimes better than – what you’ll find in much higher priced pieces. Oh, and speaking of prices, we like to keep ours affordable, ‘cause it’s no fun making great furniture unless you can make it part of your life. Custom Furniture is proudly made in America, by experienced craftsmen who understand your lifestyle and your budget. Using advanced manufacturing techniques, we build in long-lasting quality that’s usually only found in high-priced, premium pieces. Custom order made in USA modern sofa for a contemporary living room and available in a sofa, Love seat and chair sizes. Our modern interpretation of a 1960s vintage inspiration: timelessly cool, artfully tailored and delightfully detailed. An original take on a classic contemporary theme.